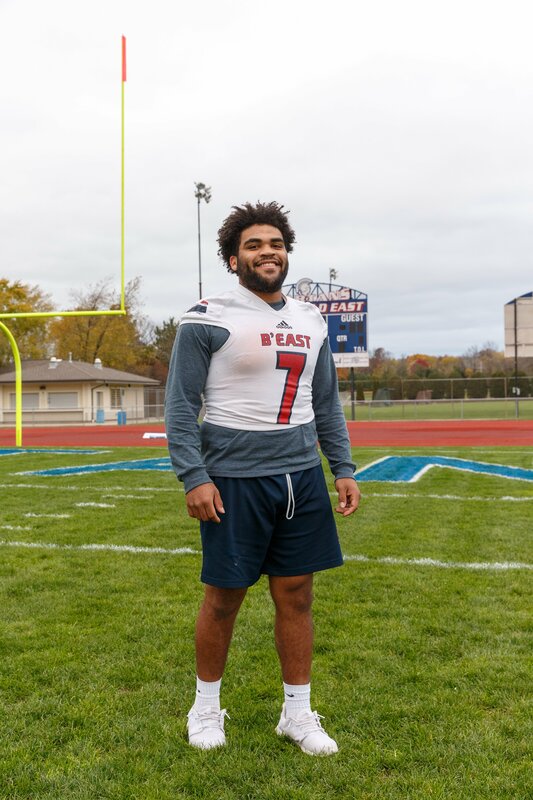 When you think of Brookfield East's pile-driving running back Sam Santiago-Lloyd, you imagine a powerful 235-pounder, moving piles of tacklers like a bulldozer moves dirt. But the outstanding senior has a different image off the gridiron. "What I really like the most about Sam is his easy-going approach," first-year Spartan head coach Ben Farley said. "He can laugh. He can have a good time, but at the same time when it's time to play football he's the most serious guy out there. "He recognizes the big moment. (He) recognizes when things are important. He's a really good student of the game. "Just the fact that he's so nice and so humble are the two biggest things. Tough practice, good practice, the day before, the day after, a good game, bad game, he's always saying 'hi' in the hallways, helping younger guys out, jumping in there at practice. And he's just a nice kid." East running backs coach Jeff Ferguson agrees. "I think he's a great kid," he said. "I think he seems a little reserved, but once you get to know him, he's a good kid." As good a career as Santiago-Lloyd has had, it might have been better except for some serious injuries his freshman and sophomore year. He talked about missing all that time early. "It was very disappointing. At one point I was very discouraged about playing," he said. "I really wanted to focus on my junior year and have a really complete year and bounce back and not let it hold me back." 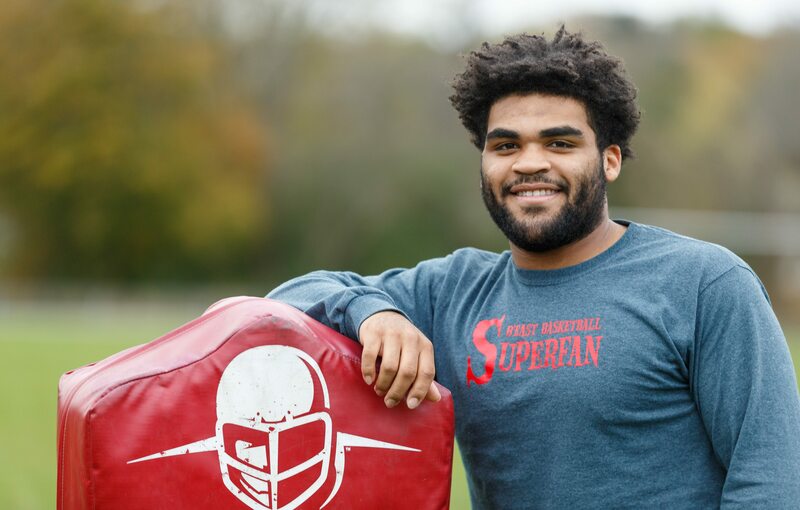 Santiago-Lloyd bounced back well, as he was the Greater Metro Conference's Back of the Year on Offense and Defense (as a linebacker) last season. He has had another good season, which could have been better. He missed one game with a right ankle injury and played sparingly in a couple others. Santiago-Lloyd is known for moving the pile and he spoke about his strategy when he is gang-tackled. "When I get the ball in my hands, I try and get vertical as soon as possible," he said. "When I make that first contact, I don't like to go to the ground. My thought it the play's not over until I'm on the ground. that's how everybody on the offense thinks." Ferguson talked about what makes Santiago-Lloyd such a tough runner. "He's a strong kid," Ferguson said. "I think his vision is underrated. He sees things that develop in front of him very well. He sees what happens, which allows him to run through a lot of tackles. His strength does too, but because he sees things develop, it gets him to a spot where he runs through an extra tackle." Santiago-Lloyd agrees with his coach, having also played on defense. "When I'm on 'O', I think about what's going through the linebackers head and how they're going to try and tackle me; are they going to go for my legs or something," he said. "It also helps a lot (because he played defense). When you're looking at a play you can see how it develops before it actually does." It might be hard to believe, but Ferguson thinks people underrate Santiago-Lloyd's speed because of his size. "Everyone (the experts) knocks his speed. I think his speed's underrated. Someone would probably say he's not as fast as I thought he was. And I don't agree with that," he said. "Their evaluation on him would be he needs to have a little more foot speed. I think it's underrated. He's a big kid. Everyone who is that big wishes they could run that well." Santiago-Lloyd didn't hesitate to talk about his strengths and weaknesses. "My strengths? I'm a team player. It's a little mix between knowledge, being physical at the point of attack; hustle, relentless effort. What do I need to improve on? I can get faster, more physical. I can do everything better." When someone is the best player on the team, he usually finds himself in a leadership role. Santiago-Lloyd is no different. "I do see myself as a leader," he said. "I don't know if I'm a vocal leader or not. I show it in some ways I guess. I have been vocal. I do try to build someone up when they're down. Before a game, I pull someone aside and amp them up. Make sure they're ready for the game. "I'm not screaming or anything. I'm more of a lead by example guy. On the field, I hit somebody, people watch me and then they get fired up and hit somebody." Ferguson, who gets to watch Santiago-Lloyd up close likes his leadership style. "He's a guy that people look to; they look to what his actions are," he said. "He's a more personable kid than what people make him out to be. He's vocal when he needs to be. He's not overly vocal. I wouldn't describe him as a rah-rah guy. But he's vocal when it's important to be vocal. They look to him and he will lead by example. "He's a well-liked guy. He's a respected guy on this team. That's very important. So I think his words carry a lot of weight." Santiago-Lloyd has been playing football since his mother entered him in a tackle-league when he was 5 years old. "When I first started football I was just the tiniest kid," Santiago-Lloyd said. "Compared to other kids, I wasn't that big, but I played linebacker. I loved the contact part about it, so I guess that's what really kept me going." Another thing that keeps Sam going is his family. Almost every game he has his own cheering section, who actually follows him on the field after the game to get a close up look when he is being interviewed. "I have a real good family. We're really close," he said. "My uncles, my aunts, my grandparents on both sides, my mom and dad and my dad's close friends and then their kids. They all come out to watch me. "It makes me feel real good knowing I have that support system to fall back on." They have had a lot to cheer about this year. Going into a Level 3 playoff game at Brookfield Central on Nov. 4, he has rushed for 1,366 yards on 198 carries, an average of 6.9 yards per attempt. He has 16 touchdowns and he averaged 136.6 yards rushing per game. He has had games rushing of 283 yards, 203, 196, 177, 151, 97, 92, 82 and 74. He has been a workhorse, carrying the ball 45 times, 31, 28, 24 and 22. Ferguson talked about the way Santiago-Lloyd handles his situation as the man who makes the Spartans go. "He's a great athlete, but I like his approach," he said. "He understands the game very well. He carries a big portion of the load, but it doesn't seem to phase him at all. He carries himself really well. He's even-keeled." Before the season Farley and Sam talked about handling the pressure this season. "We both love college football. One of the things we talked about was Stanford's (star running back) Christian McCaffrey," Farley said. "There was a big thing about how does McCaffrey handle the pressure this year. His standard line in the articles was there is no pressure because he sets his own expectations. "Sam bought into that this year. He holds himself up to high expectations He puts that pressure on himself. There is no other outside pressure. He also recognizes we're a strong senior class, playing with a strong offensive line. He's played varsity football for four years, he is very confident in his ability to run." In the last 5 games - as he regained his health - he has rushed for 859 yards, an average of 172 per game. Things are coming together for him and the Spartans, who have won three in a row. "I'm feeling a lot better than what I was," he said. "Health-wise I'm feeling really good. I'm very fired up now. The intensity is up more than ever. The health is up more than ever. Everything is just coming together." And the timing is perfect for the Spartans and their fans. FAVORITE MOVIE: Remember the Titans. Action movies. MOST MEMORABLE SPORTS MOMENT: Beating Brookfield Central in overtime in the playoffs last year. WHAT WOULD YOU LIKE TO DO IN THE FUTURE? Go to college and play football.